Since January 2016, MDE has been hosting and participating in a broad range of engagement activities, providing multiple means for Minnesota residents to provide input on the Minnesota ESSA state plan. These activities included topic specific meetings, public listening sessions, regional meetings, committees, focus groups, and community meetings. With so many venues for input, we have heard a lot! A stakeholder engagement report has been developed to provide a summary of what we have been hearing so far. Thank you to everyone who joined us February 25 for a public conversation on well-rounded education! 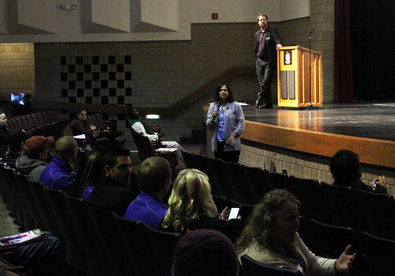 Over 50 people gathered at Brooklyn Center High School to discuss what a well-rounded education means to them. From a range of perspectives and across three diverse small groups, three themes consistently emerged. Participants defined a well-rounded education as inclusive, many-sided and community-based. Read the full report. A major part of the stakeholder engagement process for ESSA has been the formation of committees on Accountability, Assessment, Educator Quality, English Learners and School Improvement. These committees have been meeting regularly since last fall and some will continue to meet as the state plan drafting process continues. Detailed reports on to-date recommendations to the education commissioner from the Accountability, Assessment, Educator Quality and School Improvement committees have been shared on the ESSA Committees page of the MDE website. A report on the English Learner committee recommendations will be coming soon, and updated recommendations will be provided from the committees that are continuing to meet over the next few months. Last November, the U.S. Department of Education announced that the implementation year for ESSA has been pushed back to the 2018-2019 school year. So, we are now submitting our state plan in September 2017. We are looking forward to continuing to engage with stakeholders over the next six months.